Three angels are sent down to bring good to the world: Gabriel, the warrior; Ivy, the healer; and Bethany, a teenage girl who is the least experienced of the trio. But she is the most human, and when she is romantically drawn to a mortal boy, the angels fear she will not be strong enough to save anyone?especially herself...Is love a great enough power against evil? Halo is a new, intoxicating Novel. From the first sentence I was drawn in and to be honest, this book is a piece of heaven. The story is thrilling, enticing, clever and unique and if I had to describe it in three words it would be: I LOVED IT! To start off the first thing I picked up on was the description. There was so much detail in so little sentences and the whole book just played out in my head. Another compliment is that it was very well written, especially for someone of Adornetto’s age. The writing flowed smoothly and was beautiful. The book was completely smooth and was paced just right. Many reviews have mentioned Halo to be too similar to Twilight but I disagree. The book and idea is totally different and unique. This angel book is definitely what I needed. 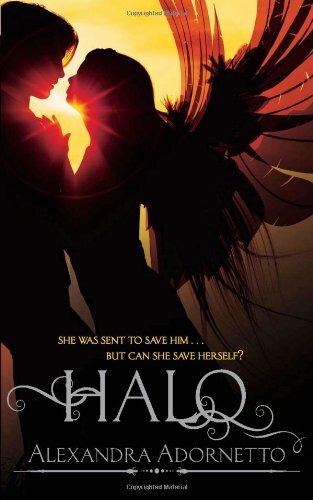 I am very much into Angels, as they are the new vampires, but all the ones I have read such as: Hush Hush, and Fallen, are all very dark and heavy but Halo followed the angel theme but was very light and airy. It is a quick read, even with around 500 pages, as you a completely engrossed and I was reading into the depths of the night even after many scolding from my parents. I just couldn’t put it down. My favourite character is Beth, no two ways about it. I think because he human-ness was being emphasized, you felt all that closer to her mentally and emotionally as all the emotions are described in so much detail. Also (being an angel and all) I found her instantly likeable. I think the first person idea was good and gave us a glimpse into Beth’s life very we!!! Overall the book has become one of my favourites and I am waiting for Hades to come out!!! The novel is a fantastic one in all aspects and for the last time... I LOVED IT!! !